Lovers of camp, rejoice! 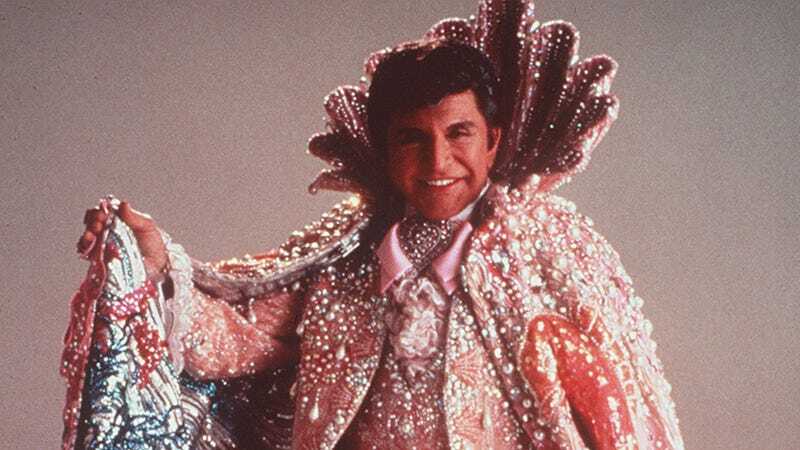 Liberace, your grandmother's most bedazzled and misguided crush, will be touring the U.S. for the first time since his death in 1987. This time as a hologram. The tour will kick off this year (exact date to be determined) in, most appropriately, Las Vegas. The Liberace Foundation is in full support, providing the hologram program with the footage necessary to create a worthwhile show. While it will look like a hologram up on stage, the technology is actually a signature kind of illusion, created by a mixture of software, new projection techniques, and optical trickery aided by what's called Pepper's Ghost. The "hologram" won't just be a typical projection, but one that will actually be able to "interact" with audience members. In fact, Jonathan Warren, the chairman of the Liberace Foundation, said in a release that those who attend the show will be able to " feel the warmth from his heart, the sparkle of his eye". I'm picking out my most sparkling fur-lined cape as we speak.